The S.C. Department of Natural Resources (DNR) is reopening Wateree River Heritage Preserve/Wildlife Management Area (HP/WMA) on Jan. 25, 2016. The property was closed in October 2015 due to flooding damage while repairs to access roads were underway. The main road systems on the property have been repaired which will allow the public to access the property. 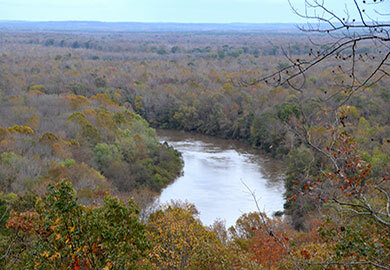 Wateree River HP/WMA is open to public use during daylight hours. Visitors are encouraged to study maps and determine boundaries on the new property. Kiosks are in place at the entrance to guide public use. Wateree River HP/WMA was acquired by DNR through a partial mitigation agreement with Haile Gold Mine for a mining operation that was permitted in Lancaster County. The area is a 3,674-acre tract of land located seventeen miles east of Columbia on Highway 378 near the Eastover community. The property is bordered by the Wateree River and is on the Richland/Sumter county line, with all of the land area in Richland County. In order to access WRHP, travel SC378 from Columbia going towards Sumter. Once you cross over SC Highway 601 travel approximately 2 miles, you will pass Goodwill Baptist Church on your right and then take a left turn onto Goodwill Road. Travel about 200 yards to the parking area and informational kiosk.